International Women’s Day exists to celebrate the achievements of women from all over the world and acts as a catalyst for change when it comes to gender inequality. Under the banner of International Women’s Day, the brings together global women’s organisations, charities, businesses, and global governments. International Women’s Day is celebrated on the 8th of March every year – lock it in! The day has been celebrated for over 100 years and today more than ever, is marked as a popular global event. The earliest observance of the day was on the 28th of February, 1909, in New York, organised by the American Socialist Party. A year later, inspired by this demonstration, Socialist representatives attended the International Women’s Conference in Copenhagen, and proposed that there be an annual International Women’s Day. It was agreed that, as part of a strategy to promote equal rights for women and women’s suffrage, an international day should be formed. European countries such as Austria, Denmark, Germany and Switzerland were among the first to celebrate the day on March 19, 1911. Two years later, in 1913, the date was moved to March 8 and it has been celebrated on this day ever since. The theme of this year’s international womens day is #PressforProgress. Now more than ever, there’s a strong call for action to press forward and progress gender parity. Last year, the World Economic Forum found that the global gender gap will take 100 years to close, at the current rate of progress. This represents quite the decline over 2016 where it was estimated to be 83 years. Join the global call to #PressforProgress motivating and uniting friends, family, colleagues and entire communities to think, act and be gender inclusive. This stunning portrait of Sierra Leone’s only woman surfer, 19-year-old Kadiatu Kamara (aka KK) tells a poetic story a determined young woman in a man’s world, motivated by one thing: her love of the waves. British Directors Daniel Ali and Louis Leeson’s film, A Million Waves, hits the dawn swell at Bureh Beach, a coastal village south of Freetown. Ali and Louis Leeson embeded themselves into the community and settled on telling KK’s story. Born into civil war and living through the Ebola epidemic that ravaged her nation, KKs’ story is not one of tragedy. Rather it’s a story of of escapism from the harsh realities of domestic life in West Africa and a love affair with one of the only surf breaks in the country. At the time of filming this, KK was living at home as a student, and supporting her family. Without her father’s income, she made hats and tote bags to sell to the few tourists that make it tohrough her village. Surfing is her favourite past time, but reserved only for the early mornings and evenings, when she has completed her domestic duties and studies. 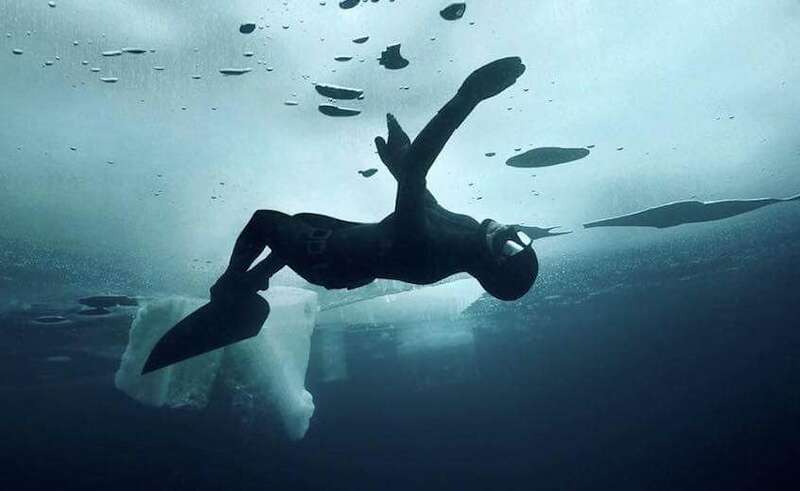 Finnish freediver Johanna Nordblad currently holds the Guinness World Record for females for a 50-meter dive under ice. Interestingly, close to International Women’s Day on March 14th, 2015, Johanna dove for 50 metres under the ice in 2 °C cold water of Lake Päijänne, while only wearing a swimsuit and mask. Johanna discovered her love for the sport through cold-water treatment while recovering from a downhill cycling accident that almost took her leg in 2010. Johanna started cold water treatment (ice therapy) for her broken leg in 2013 upon recommendation from her doctor. British director and photographer Ian Derry captures her taking a plunge under the Arctic ice. Internationally acclaimed photographer and filmmaker, Todd Cole, hits the waves with 6x World Champion Winning Surfer, Stephanie Gilmore, to the sounds of Liars (LA-based band). Sliding her way through black and white breaking waves, Stephanie Gilmore makes for the ultimate artisitc subject in Trestles Forever, filmed on the Pacific Ocean. California-based Todd Cole turned to cinematographer Sonny Miller, who specialises in ocean related film, to capture Gilmore’s unique style in the water. Stephanie, now 30-year-old rose to international prominence in 2007 as a rookie when she snatched up the Women’s World Title for the first time, an award she has regained consecutively for the three years following – an accomplishment no other surfer has achieved in the history of men’s or women’s surfing. I wanted to create something emotionally true and elemental… Light, water, and a strong, talented, beautiful woman, all dancing around. Happy International Women’s Day! We’re celebrating the women who have changed the world.